I totally missed this (it must be the exhaustion from working extra hours doing nothing) but the almighty Kobe Bryant finally released the $110 Mexican Blanket Nike shoes, which -as everybody knows- are as cozy and sporty as a real Mexican blanket; except that you can buy a Mexican blanket in any Mexican flea market for about 30 pesos. 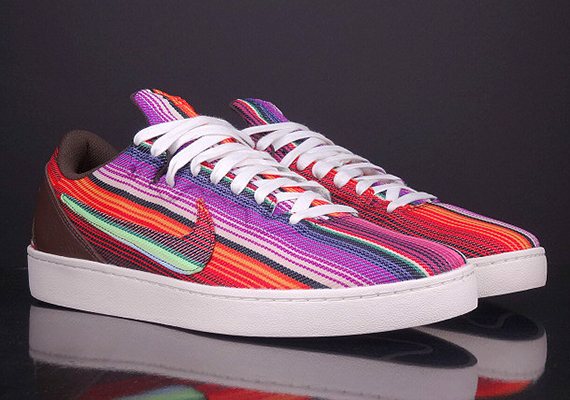 Nevertheless, the Nike Kobe 8 Mexican Blanket shoes are available for purchase online, and while they look totally awesome, I think they are not nearly as cool as the Cinco de Mayo sneakers. What are you waiting for? Pick a pair and get ready to go ‘dunking’ á la mexicana. This entry was posted in Marketing & Advertising and tagged Kobe Bryant, Mexican shoes, Nike. Bookmark the permalink.